This article is based on IPA Upstream Industry Benchmarking Consortium (UIBC) research titled: “The Neglected State of Site & Sustaining Capital Projects” (November 2016). The exploration and production (E&P) industry, forced by market context, is shifting its focus and capital investment priorities. Starting with the downturn in oil prices in 2014, oil and gas companies have been cutting back on capital investments in large, high risk – high reward, long-cycle projects—the projects often referred to as megaprojects. Now that oil prices are levelling off in the mid-$50s with the real possibility of a “lower forever” state, owner companies are investing increasing proportions of their overall capital spend – almost 40 percent and more – on small and medium-sized “short-cycle projects.” While the term and focus may be new and “catchy,” the fact is that these projects, known throughout Industry by their less catchy name, sustaining capital projects, have always been around. For large oil and gas owner companies, these short-cycle projects to sustain existing site production and operations help maintain business cash flow and keep company shareholders happy. But for smaller owner companies, short-cycle projects are critical for their financial survival. Fast-track subsea tie-backs, onshore brownfield production/maintenance, offshore facilities modifications, and add-ons are among the project types that help to maintain production levels and keep E&P business units from falling off a cash flow cliff. However, many owners are using a flawed approach to delivering short-cycle projects, resulting in millions in wasted capital. In fact, while the industry spent the better part of last decade doing megaprojects, it did not pay much attention to these short-cycle projects. The industry cannot simply pivot and expect superior delivery on short-cycle projects without a concerted, well-thought-out, and holistic approach. While owners usually regard smaller, short-cycle projects as being less demanding on their project organizations and easier to accomplish, IPA upstream project data indicate effective capital spending on short-cycle projects eludes owners—more than many would care to admit. In fact, some short-cycle project outcomes are worse than outcomes on larger projects that owners regularly struggle to deliver effectively. What Is the Stake for Business Leaders? Business leaders expect short-cycle projects to be delivered on time and on budget and to attain the required functionality. Unfortunately, the cost outcomes for short-cycle capital projects are, on average, 20 percent more expensive than the industry benchmark for the given scope of work, according to IPA’s most recent study of over 300 projects delivered by 18 companies.1 That means for a given portfolio of US$2 billion, the lost opportunity cost is approximately US$400 million. That is enough money to fund another larger project. 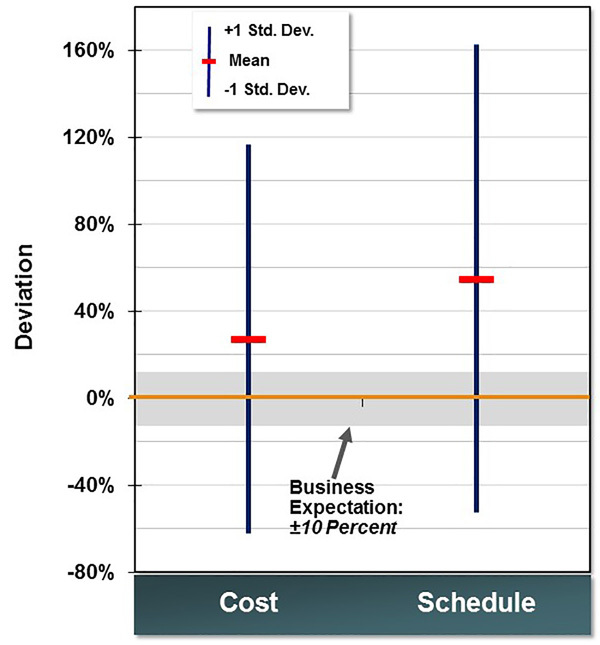 Besides absolute cost effectiveness, cost and schedule predictability for E&P short-cycle projects is problematic for many companies. Although most sustaining capital project portfolios have business expectations of ±10 percent predictability at authorization, IPA research shows just how large these deviations from business expectations are. As the figure shows, E&P short-cycle projects are overrunning their cost targets by up to 120 percent in some instances. Schedule performance is even worse. The volatility of cost and schedule outcomes on these projects cannot be ignored. Short-cycle projects comprise 80 percent of the projects in most E&P business unit portfolios for the near future. And yet, despite the huge amount of capital and critical nature of these sustaining capital projects, business leaders do not pay half as much attention to short-cycle projects as they do to large projects and career-defining megaprojects. Why Are E&P Short-Cycle Projects Failing? As a manager of a mid-size IOC told IPA: “Corporate has been too preoccupied by flagship projects in the past 5 years and does not pay attention to smaller investment, so at the moment, these projects are a joyful mess.” In a separate interview, a portfolio manager of a major IOC said, “Every business unit has its own recipe for the small ones, which drives inconsistent results.” Both observations speak to why many E&P short-cycle projects frequently miss cost and schedule targets by a wide margin. Some owners are guilty of turning over too much responsibility for scoping and defining projects in their sustaining project portfolios to contractor teams while keeping a single owner project manager as the primary interface with business during execution. With the contractor playing significant roles on projects, owner involvement is not sufficient to ensure effective delivery of the short-cycle project portfolio. Business leaders need to be more involved with how their sustaining project portfolios are managed. What criteria are we using to differentiate and separate short-cycle, sustaining capital projects from major projects? How do we modify our work processes to specifically cater for these short-cycle projects? How should the organizational structure and approach evolve to support a portfolio tilted towards short cycle projects? Categorization — Short-cycle projects, given their relatively smaller size and scope, are usually ranked within an entire capital projects portfolio as less complex and “easier” to execute. This is the first and most common misstep. Short-cycle projects, not unlike larger projects, may indeed involve unique complexity factors that must be considered during front-end planning and the development phases. During our work with several clients, IPA identified 18 complexity elements unique to short-cycle projects that if ignored can severely erode company profitability because decision makers too often fail to create a holistic complexity-based ranking for differentiating between “major” and “non-major” projects; they also fail to organize and execute the “non-major” projects with the right amount of attention and discipline. Work Process and Organization — Across the Industry, project organizations lack critical resources when making short-cycle project categorization decisions. Further, vital project team functions are missing, and work processes are over-simplified (using Lite and Ultra-Lite work processes versions is common, if a process is followed at all). Teams are set up to be acutely lean and multiple functions are consistently lacking. Hence, by applying these “simplifications,” we create chaos. Even if companies are unwilling to dedicate more resources to delivering short-cycle projects, appropriate work process adaptations are necessary to drive effective and predictable results. So the question becomes: How can business decisions be made to give the right amount of attention, without eroding value from these projects? In delivering work process modifications for our clients, IPA discovered a unique way a company’s work process can largely be kept intact while substantially reducing the “bureaucracy” and “burden” on short-cycle projects. The dynamic interactions of the three business decisions mentioned above are crucial to delivering successful short-cycle project portfolios. Painstaking effort would be necessary to find just the right point in which a system designed for delivering short-cycle projects is properly balanced. However, therein lies the solution. The call for action is for business leaders and decision makers to assess their portfolios to identify how these three business decisions interact to affect short-cycle project outcomes. The importance of these projects cannot be over emphasized. Industry must begin to improve how these project portfolios are executed— the current state of the business is not sustainable. There is no single silver bullet for every portfolio. Business leaders and decision makers have to realize that the pivot from delivering large projects to delivering smaller projects requires a thoughtful approach. By first assessing the project system’s health in context with the organizational effectiveness and capabilities, project classification, and organization structure, decision makers can seek targeted solutions. IPA has developed expertise through research to help business leaders and decision makers create an effective portfolio management matrix for sustainable short-cycle project delivery. 1<.sup> Vincent Mouraï and Ray Rui, “The Neglected State of SSC Projects,” UIBC 2016, IPA, November 2016.